Anything pertaining to the Bible, the Church, God, Christ, etc. On Friday morning I got a voice mail from my dad at 7:00am. He said, “Call me back when you get a chance. Your grandmother died this morning.” Click. For some of you, reading that last sentence might have you thinking, “oh man, sorry to hear that.” Well, thank you, but honestly I didn’t really know my mom’s mom. I spent a few sporadic days with her as a child and maybe have seen her only a handful of times since I was little. It’s just the nature of my family situation but I was never really close with any of my grandparents. I was the youngest of many kids and my grandparents have always lived a good distance from us. Obviously, I’m a little sad. Death is never something you can just balk at, or at least you shouldn’t. This might sound weird, but I actually think about my dad dying a lot. Not because I want him to, of course, but because I know it’s going to happen some day. I think about his funeral and what I want to say. I think about how much of the family will be there and what I would want them to hear. I assume I’ll be able to speak at my dad’s funeral? Thinking about death is something we should do. For me, it keeps me “numbering my days” and “making the most of the time.” I don’t know why, I just think about it a lot. Even this afternoon I was playing with my 2-year old Titus and wondering what I would feel if God somehow took him. I would definitely be in pain, but because I know God is sovereign over everything I would hope that would keep my heart above water. I guess I just don’t want death to surprise me. I want to be ready, at all times, for death. It’s hard enough as it is to lose a friend or relative, so maybe by thinking about it more often I can try and minimize the hurt? I don’t know — I just know what goes through my head. When I think about dying I realize that the individual days matter. What I’m doing right now at this very moment matters. It all adds up to the whole. I don’t want to get to the end of my life and think “man, I wish I would’ve ____________.” What is that? That kind of regret starts today somewhere. Whether it be spending time with my wife, kids, family or other things like reading the Bible more or working out to stay fit. I remember my friend in high school asking his mom if she was going to make it to our soccer game. She had a pretty intense job in the medical world. But she said, “Of course I will be. I won’t be at the end of my life thinking ‘wow, wish I would’ve worked more’. I’ll want to have spent more time with my family.” That’s making the individual days count — that’s thinking long term. It’s the 68th anniversary of D-Day today. This video is the prayer that President Franklin D. Roosevelt prayed that day. You can read the entire prayer here. I’ve been thinking a lot about WWII the past few days. As I’m reading the biography on Bonhoeffer, it’s been leading up to the rise of Hitler in Germany and last night I came to the year 1933. This was the year that Hitler came in to power as the chancellor of Germany. Obviously, if you’re an American you have heard about WWII from our perspective, that is, as an Allied force that had to spend the lives of many men and women in order to stop Hitler. But in reading Bonhoeffer my eyes are being opened to what it was like over there during that time. In just the first few months of becoming chancellor Hitler turned a republic in to a dictatorship and then quickly turned the Germans against the Jews. I guess I always thought it took him more time than that, but it really was just a few short months and he was on a path that lead to murder of millions of people. I’m thankful to God today for the people who willingly gave their lives to protect not just the German or Jewish people, but many others. They did not, and do not, bear the sword in vain. Let every person be subject to the governing authorities. For there is no authority except from God, and those that exist have been instituted by God. Therefore whoever resists the authorities resists what God has appointed, and those who resist will incur judgment. For rulers are not a terror to good conduct, but to bad. Would you have no fear of the one who is in authority? Then do what is good, and you will receive his approval,for he is God’s servant for your good. But if you do wrong, be afraid, for he does not bear the sword in vain. For he is the servant of God, an avenger who carries out God’s wrath on the wrongdoer. 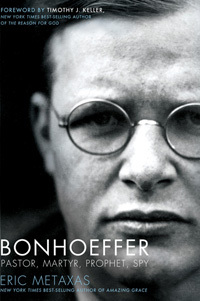 After 119 pages (of 608), I’m absolutely enthralled with Eric Metaxas’ biography on Dietrich Bonhoeffer. The life of Bonhoeffer is amazing to me (even after only 20% of the book), and Mextaxas is opening my eyes to a world that I just didn’t know about before. One thing that I just can’t get out of mind is the perspective Bonhoeffer has on the world around him as his extensive travels take him literally every where, including the USA in 1930 (post World War I). As a German national, he provides a very unique perspective our this side of the Atlantic, and it has challenged me to think about what it means to be a Christian and live in a specific country at any point in history. It’s a challenging thought as I think about how much living in America shapes my view of the world around me. Even though I strive to see it through a Biblical lens, I often see it through my American one, and that is sometimes hard to swallow. All that to say, I’m excited about the remainder of this story and this man. I hope to learn from his experiences, his insight, and maybe even his death. If you’re interested in following my progress, I post regular updates on GoodReads. If we want to see the fabric of American evangelicalism aligned to the heart of God, we have to go to the nations. We have to step outside of our individualistic, ethno-centric cultural grid and have our value systems shocked to the core, our perspectives wildly flipped upside down and our little worlds of comfort deeply rattled by the discomforting reality of a world population that desperately needs of Jesus. It will forever shift our affections, realign our priorities, and catalyze us to relentlessly pursue the exaltation of God among all peoples, counting as joy whatever cost, whatever personal sacrifice, and whatever American dream that must die in us along the way. Your going there will forever change how you live here. I don’t have a Kindle or any e-reader for that matter, but if I did I’d be buying this $0.95 (yes, 95 cents!) 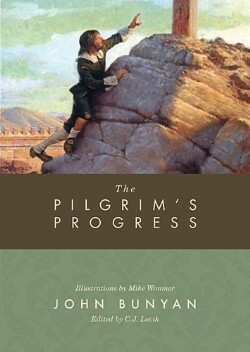 copy of The Pilgrim’s Progress. Not sure how long this deal will last, so go get a copy of this wonderful book for cheap. Buy it here: Amazon.com: The Pilgrim’s Progress: From This World to That Which Is to Come eBook: John Bunyan, C. J. Lovik, Mike Wimmer: Kindle Store.